Yokozuna Hakuho kick-started his bid for a third consecutive Emperor’s Cup by smashing Chiyotairyu, but Goeido’s debut at ozeki was marked with a defeat on the opening day of the Autumn Grand Sumo Tournament in Tokyo on Sunday. Hakuho capped a successful day for the three Mongolian yokozuna with a sumo clinic in the day’s final bout at Ryogoku Kokugikan, picking his spot to yank komusubi Chiyotairyu down by the back of the neck. Harumafuji, who was a pedestrian 10-5 in July, packed plenty of punch in his bout against Endo, smashing the popular maegashira at the charge before finishing the job with a “hatakikomi” slap-down. Kakuryu, the most recent addition to the top yokozuna rank, also scored a slap-down win after outslugging newly promoted komusubi Jokoryu. Goeido, though, never looked convincing in his bout against maegashira Takayasu. Ringside judges awarded Takayasu the victory after convening to determine whether Takayasu’s heel had touched the dirt outside the ring before the ozeki came crashing down. In other bouts featuring ozeki, Kisenosato muscled out No. 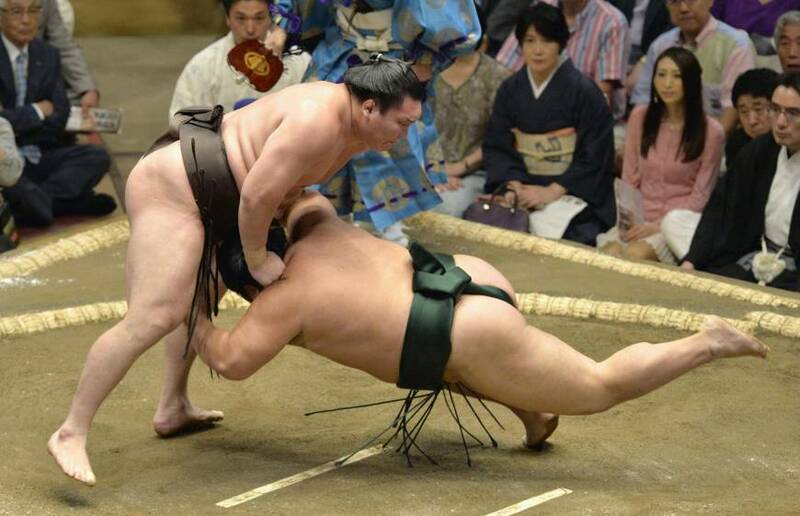 2 maegashira Toyonoshima, but Kotoshogiku got mugged at the charge as top-ranked maegashira Terunofuji jumped aside to slap him down for the win. Meanwhile, Takekaze was unable to mark his debut at sekiwake with a win as he was pulled down by Bulgarian No. 3 maegashira Aoiyama. 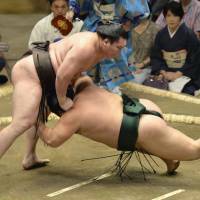 Chuo University graduate Takekaze is the slowest to reach the sumo’s third-highest rank, requiring 68 tournaments. In an earlier bout, veteran Kyokutenho scored an opening day win a day after his 40th birthday, the Mongolian rolling back the years with a well-worked beltless arm throw against 15th-ranked Okinoumi. “It feels good. I had a great birthday and celebrated it with lots of people and I am glad I could win today,” said Kyokutenho, the first 40-year-old in the elite class since the start of the six tournament system. “It’s still early days but hopefully I can get a winning record,” he said.